Love coffee but hate the idea of drinking a hot beverage when the temperature is nearing triple digits outside? Well why no go for the chilled-out version, iced coffee! Brew a pot of your favorite coffee and let it cool for five minutes so that you don’t scald yourself if you spill some. Pour the coffee into standard ice cube trays (as many as you want) and place them in the freezer. When the coffee cubes are frozen solid, fill a tall glass with them. Pour milk over the cubes and watch as they melt and start forming a delicious, all-natural summer drink! If you keep your freezer stocked with coffee cubes and your fridge full of Hiland Dairy Milk, you’ll never run out of this delicious summertime treat! Try one of Hiland Dairy’s Iced Coffee flavors instead. Of course if you don’t feel like making your own, you can always pick up a carton of deliciously creamy Hiland Dairy Iced Coffee – available in three mouthwatering flavors: Mocha, Caramel and Vanilla. 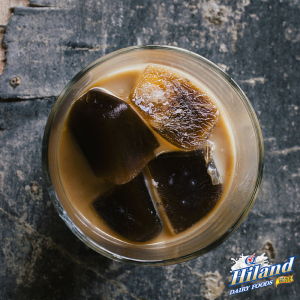 And come to think of it, if you want to keep your Hiland Dairy Iced Coffee cool, you could add the coffee cubes from the recipe above so that instead of watering it down, you’re powering it up with more coffee! Note: If your local store doesn’t carry Hiland Dairy Iced Coffee, print and fill out this Hiland Dairy Shopper Request Form (PDF) and take it to your grocer.